You can access this area by clicking on the user icon at the top right corner of the screen. Settings in this area will allow you to set up fully functional e-commerce on your site with Snipcart. Please note that you must provide your account billing information [see section 2.2.3] before choosing a payment gateway. Also note that you can conduct unlimited dummy transactions in the test environment before going live [see section 3]. You can connect only one payment gateway to a Snipcart account. 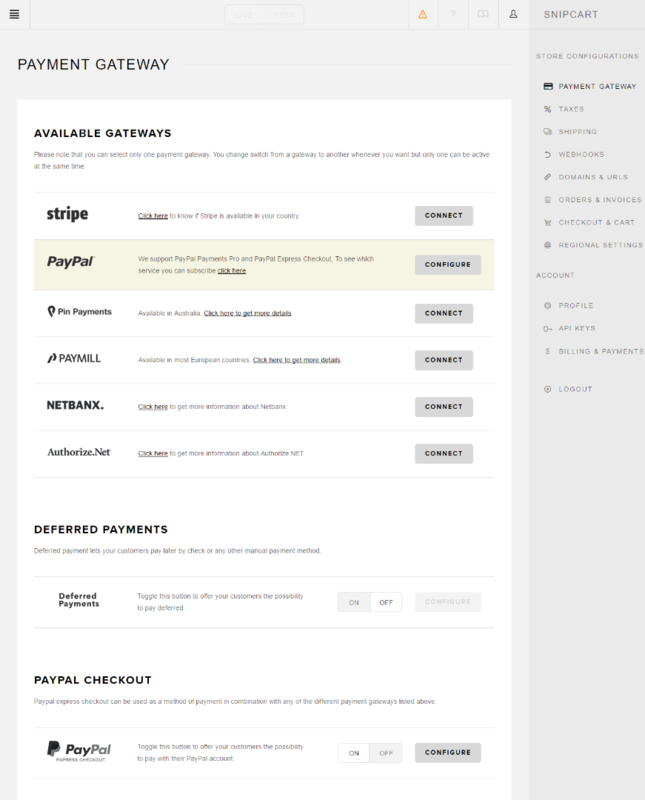 In this section, you'll see all the payment gateways we support. Select the gateway you want to connect and follow the instructions from there. In the example above, PayPal is connected to the Snipcart account. Enabling this will allow customers to place orders on your online store and pay later via either check or other manual payment methods. Once you enable deferred payments you'll be able to access the configuration section and you will get this option: Only allow deferred payments. If you don't want any payments to be processed on your store via credit cards online, mark this box. Read our documentation details on configuring PayPal Express Checkout & PayPal Payments Pro with Snipcart. 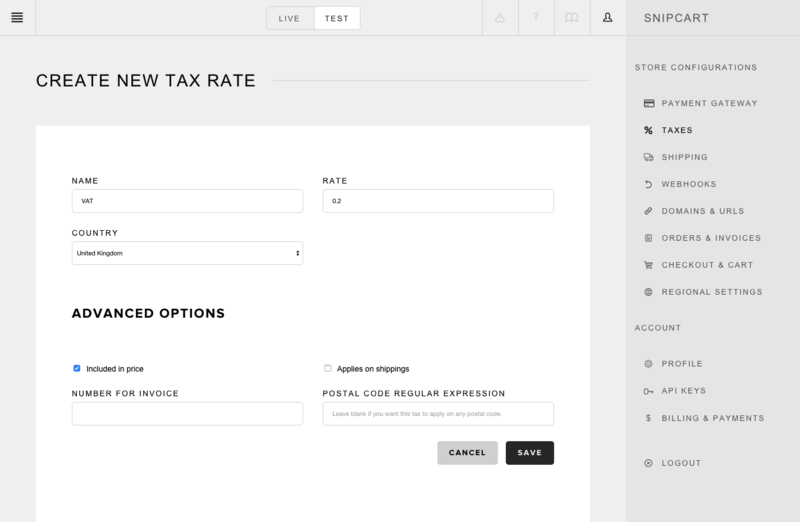 This section is where you'll create the different tax rates you need to operate your e-commerce site. First, enter your tax name, it's rate, and select the country for which it applies. If you want to include taxes directly in your prices, mark the Included in price checkbox. You can mark the Applies to shipping box if you want your tax rates to be applied on your shipping fees as well. If your company must display it's tax number on invoices, you can use the Number for invoice field to that effect. The Postal code regular expression can be used to assign your tax rate to specific regional areas. For merchants operating with a physical presence (or nexus) in the USA, we have a helpful integration with TaxCloud (tax automation software). 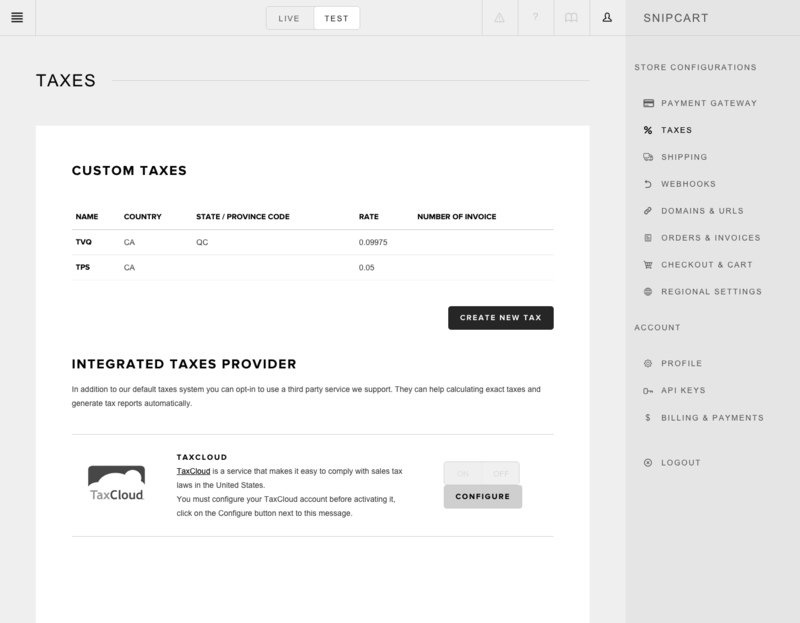 Here are further instructions to configure TaxCloud with your Snipcart account. For merchants operating with a physical presence in Canada, Australia or Europe, we have an integration with TaxJar. You can learn more on how to configure those taxes providers in this section of our documentation. If you'd like us to consider integrating with another automated tax provider, go ahead and submit a feature suggestion. This is where you'll connect with one of the e-commerce shipping providers we support or set up your own shipping methods. Note that both shipping provider rates & custom rates can be offered at the same time. If you don't need to ship physical products, toggle this button to off. Use this field to enter the amount of potential handling fees your e-commerce operation involves. This amount will be automatically added to rates returned by your chosen shipping providers or custom methods. 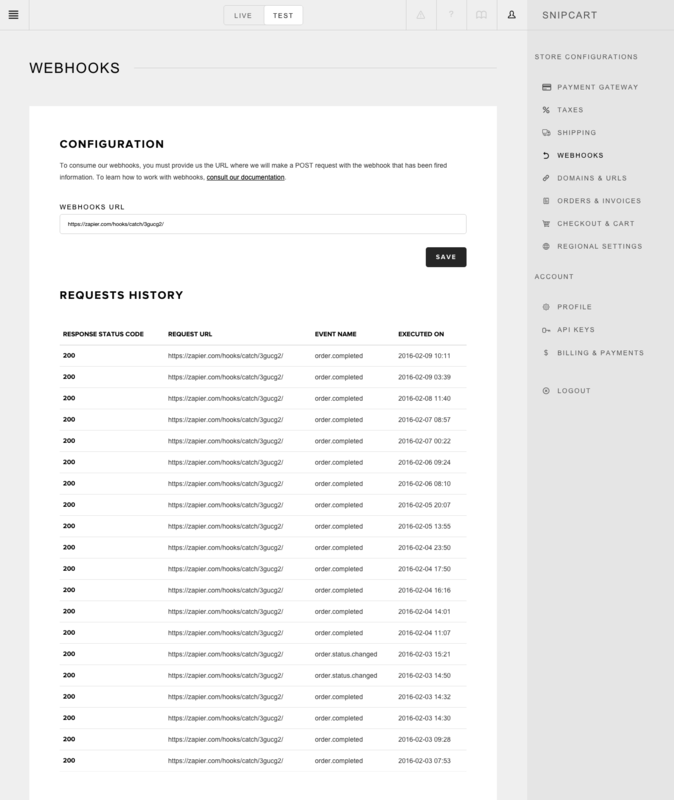 Developers who want full control on shipping calculations can use our webhooks to do so. See this documentation section for details. Use this option to configure your own shipping methods by location, delivery time, & weight. Configured custom shipping methods matching customer shipping address and order cart content will be offered to your customers during checkout. You can define multiple rates per shipping method, defined by different weight ranges. Please note: if you'd like to only use location as a determining factor for your shipping method's cost, just create a single rate with empty weight fields. In the example below, if the order total weight is less than 1000g then the shipping would cost 10.00$. If the weight was between 1000g and 2000g, it would then cost 20.00$. And for orders over 2000g, it would cost 30.00$. We currently support six different shipping providers: FedEx, USPS, UPS, Purolator, Canada Post & Australia Post. As a merchant, you can activate as many shipping providers as you want for your store. Some of them will require you to hit the Configure button and enter your own specific credentials. If you'd like us to support another shipping provider, you can suggest it. In this section, you can use webhooks to make Snipcart's application communicate with other applications (email marketing, shipping automation, inventory management, CRM, etc.). To learn more about how to use webhooks, please refer to this documentation section. This section can be very helpful when developing your application and integration with our webhooks. 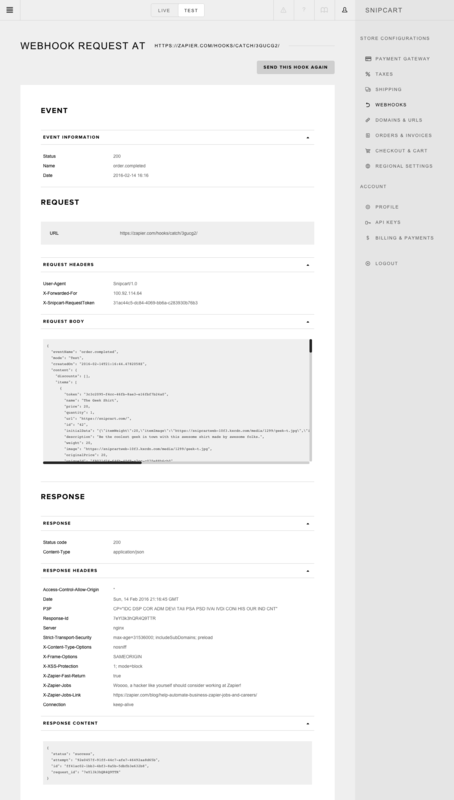 You can see the complete details of the HTTP request that we sent to your application. You'll also see the response we received from your side. Using the Send this hook again button will trigger another call from our application to yours. It can be very helpful while debugging. 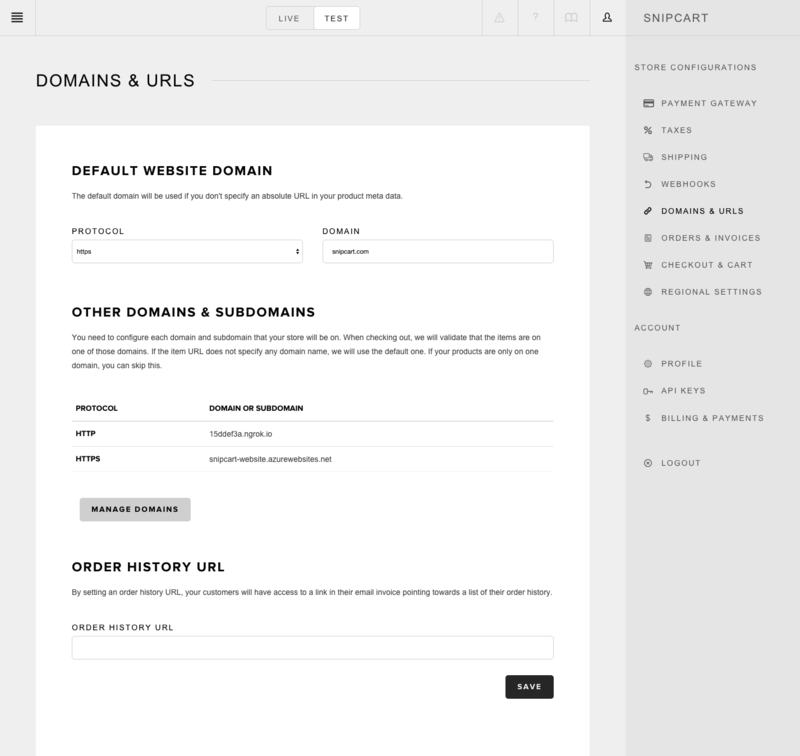 Use this section to determine which domains and subdomains your Snipcart store can live on. If you're using relative URLs to define your products' data-item-url properties, Snipcart will always assume the default website domain entered in this field is used. If you're using the same Snipcart account on different domains and subdomains, you need to use absolute URLs for the data-item-attribute property of your products. Learn more about product attributes definition, see this documentation section. You can skip this section if your Snipcart products are sold on a single, unique domain. 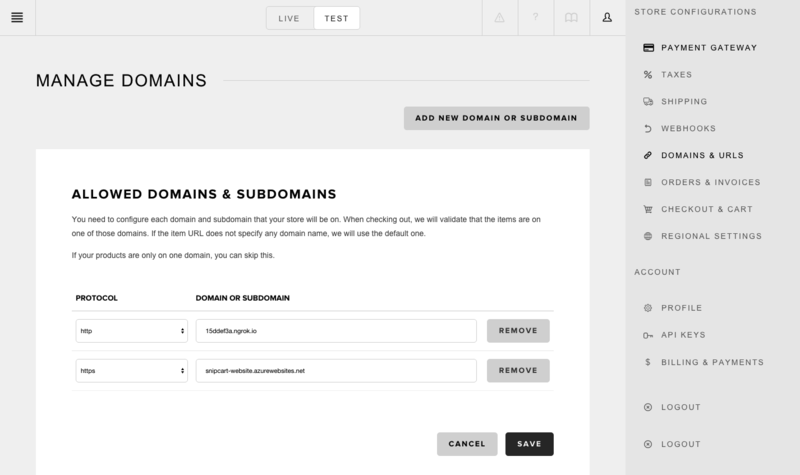 Hit the Add new domain or subdomain button to add a domain or subdomain, enter it in the new field, and save it. When your customers are checking out, we validate that the products are on one of these domains. If the data-item-url does not specify any domain name, we will use the default one. Please note that this must be an absolute URL. By setting an order history URL, your customers will have access to a link in their email invoices pointing towards a list of their order history. This URL can be anything on your domains/subdomains, as long as it has the snipcart.js file in the source. You could enter your store home page, for instance (https://yoursite.com/shop). The customer will click on the email link, be redirected to your store home page, and see Snipcart pop-up and display a list of his orders. 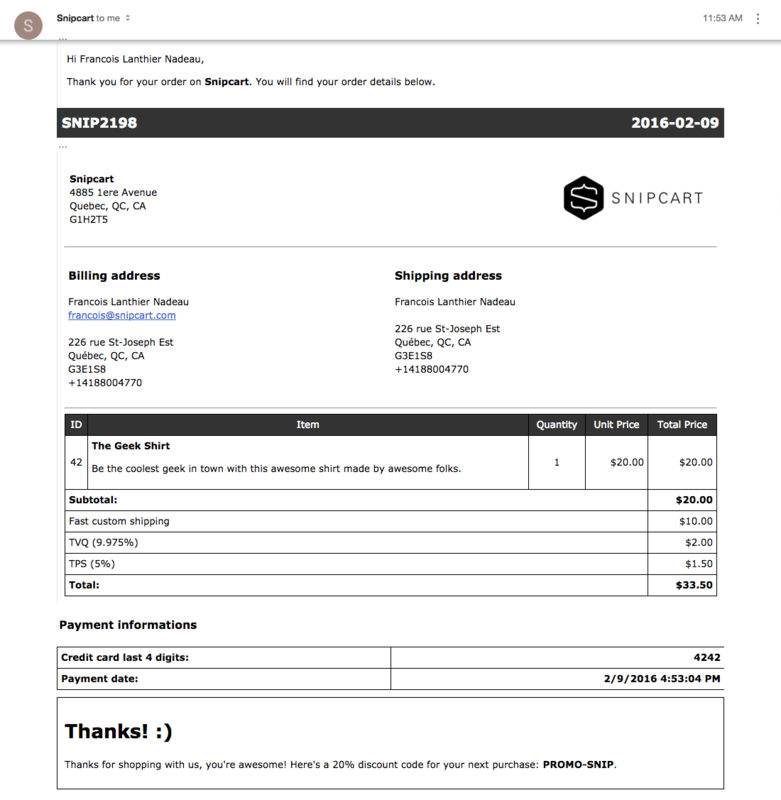 This section will allow you to customize the email invoices your customers receive after checking out through Snipcart. Marking this checkbox will remove the login and registration steps from your cart checkout. If you don't need customers to create an account on your Snipcart store, activate it. It'll speed up their checkout process. Marking this checkbox will trigger automatic short email notifications as soon as orders are completed on your Snipcart store. These notifications will be sent to the email address you used to create your Snipcart account. Marking this checkbox will automatically send BCC hidden copies of each email invoice your customers receive after completing checkout on your store. These notifications will be sent to the email address you enter in the field below that option. Marking this checkbox will allow Snipcart to send data to Google Analytics E-Commerce Tracking. This integration will enable close tracking of e-commerce metrics such as time to purchase, product performance, sales performance by channels, product conversion rates and much more. To learn how to fully set up your Snipcart store with Google Analytics E-Commerce Tracking, follow the instructions in this post. Marking this checkbox will trigger the automatic sending of email invoices to customers after each completed order. 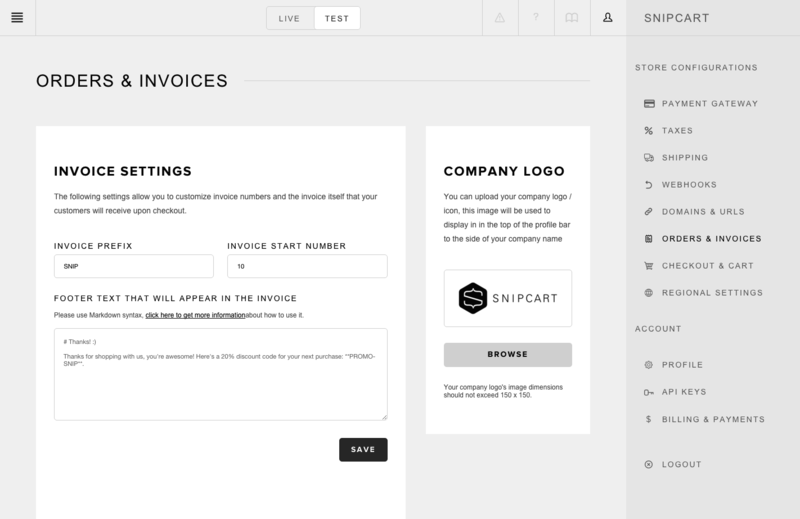 If you'd rather send invoices on your own, without the help of Snipcart's automated invoice service, leave this box un-marked. 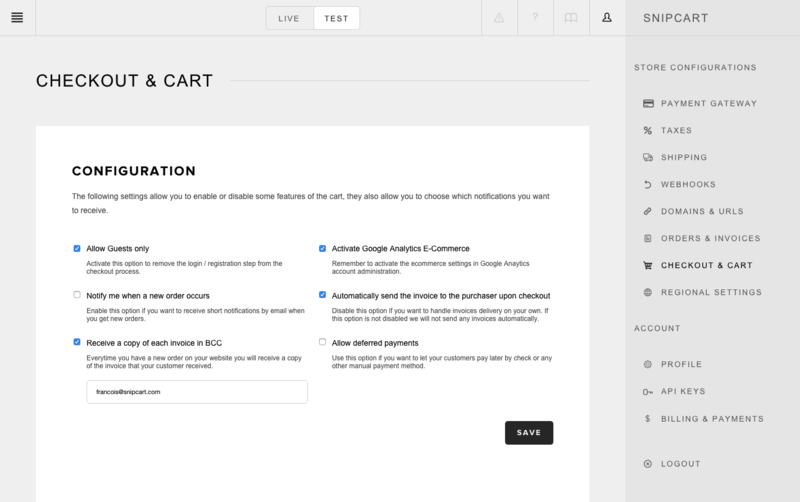 This section will allow you to enable the countries and currencies you want your store to support. In the screenshot above, you can see that CAD, USD & EUR have been set for the store. Once you hit the Add currency button, things are pretty straightforward. You select the currency from the dropdown menu, set a symbol, and define the formatting it to have. Learn more about how to set up multiple currencies on your store with Snipcart in the related documentation section. We also have a how-to blog post showing how to display multiple currencies on your site & cart. Use this dropdown to select your business timezone. Dates will then be shown in the correct timezone in invoices and other emails. By default, UTC will be used. Available countries are divided by continents. To save some time here, you can use the quick Select/Unselect all countries link for each continent. During checkout, billing addresses and shipping won't be available for customers coming from the countries you have not marked on this list. Snipcart is available in mostly all countries over the world. However, depending on your chosen payment gateway, some countries might not be available. In this section, you'll be able to enable inventory management for your Snipcart store and products. Switching this toggle to ON will allow you to assign stock levels to your products under the Products section of your merchant dashboard. You can check out this feature page on inventory for more details.